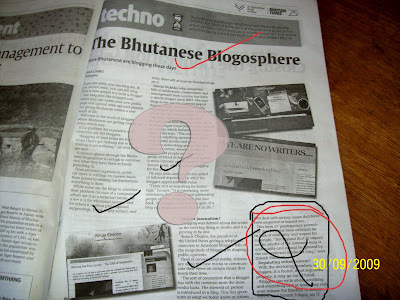 I am extremely pleased to read a full page coverage on the rising popularity of Bhutanese blogger in the "techno" page of Bhutan Times. Screen shots of four blogs are presented there and surprisingly all four of them are in my blog roll; why was I left out? Ha ha ha, just being funny. The story covers a lot of aspects through interviews with many blogger, some of them were blogging since 2007; it's sad they didn't know I was blogging since 2006 and not body called me up to get an interview. The story is all pleasing and could draw new people into the techno-hobby. I didn't know Barack Obama was so positive about it but our opposition leader makes the best use of it to get public opinion on his views. Even companies with big websites are resorting to creating blog version of their websites to dash with the popularity of blogs. The whole world is into it now, there is no greater gift of democracy. 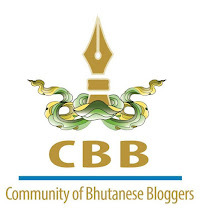 Bhutanese are finally learning to accept the gift from the Constitution of Kingdom of Bhutan- the freedom of expression, with clear vision of limit though. But the closing section of the article talks about "Regulating online content?" and I am shocked by some comments there, which are threatening to question the freedom of expression. Exactly my point PaSsu there! The article might have been written in good faith, but it sure raises eyebrows of some 'concerned' officials. And once they interfere, story will be different. Is there a need to write such article in the first place? Of course I have seen some Indian newspapers writing about blogging. If you scan through blogospehere, most journalists have blogs. And why would a journalist want blogging regulations and public attention? Blogging is a personal thing; never intended to disrupt our nation's sovereignty. Hopefully our right and freedom to blog are preserved always. Let bloggers blog! And in peace! "We need no attention!" I agree PenStar that we, but especially i keep blog, not to gain atention but just to keep on writing for passion but with greater responsibility!!! I do not agree 99 % with "regulating online content"! It will be depriving ppl of freedom of speech! i would like to make a few clarifications here. passu has raised an interesting question. As a news writer, a reporter needs to keep in mind that the story is complete. That can happen only when it touches various sub-issues and aspects related to the larger one. Anyway...bloggers should be happy at least for now BICMA does not have nay such regulations and may not have, for some time to go! I appreciate that blogging is picking up and bloggers like you guys are taking this forward..keep it up!!!! !